Do you like my new tote? I kind of like it too. 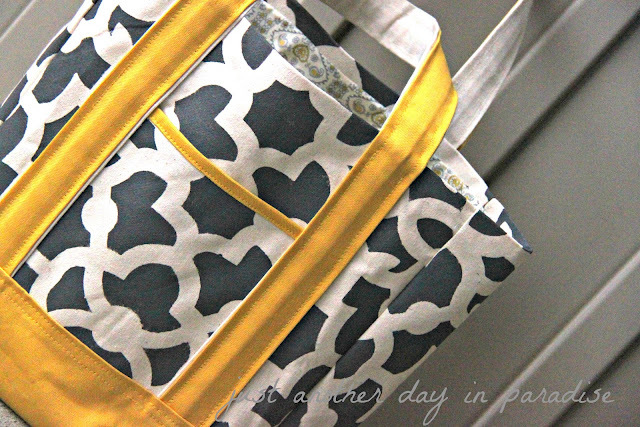 My favorite thing about this bag is that I was able to custom make the main material to my little hearts delight. Yup, that is right. The main material was completely custom made. Custom made you say? But that sounds like too much work and it sounds haaaarrd. Guess what! Making my own custom fabric was easy peasy all thanks to Cutting Edge Stencils. Cutting Edge Stencils contacted me asking me to review one of their stencils. I of course immediately said, "Why happily!" 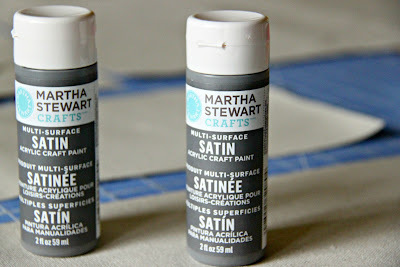 They make so many fantastic stencils great for a variety of projects. I honestly couldn't decide. I literally took a week before finally narrowing down what to do. Do I pick one of their fabulous wall stencils? If so, which one...for the love which one?!? Which wall? The possibilities are virtually endless and all wonderful. What is a girl to do? But the possibilities didn't stop there. They have new craft stencils perfect for fabric and smaller projects. Did you catch that I just said they make stencils for fabric? That was a hint to what I chose. After much hemming and hawing I finally made my decision. Craft stencil it was. The Zamira craft stencil to be exact. Once I made my decision, I could hardly wait for my stencil to get here. Then it came! 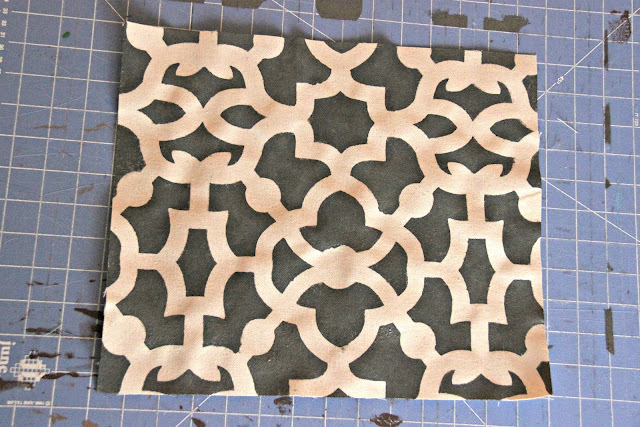 This stencil can be used on fabric and on any small project. I had visions of this tote almost right away. I also knew I wanted my pattern to be gray. 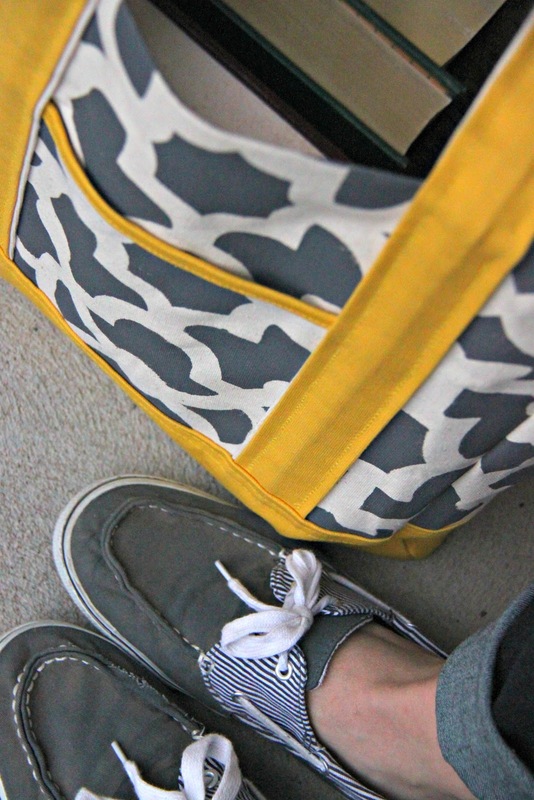 I really have a fondness for gray. I bought simple white duck cloth for my fabric canvas. I picked out my paint. I cut out all my pieces and then I started to stencil away. The stencil was easy to use and only took a little patience. The good news is that Cutting Edge Stencils has a simple How-to-Stencil videos. Once I got the hang of stenciling, it was a breeze. I soon had several lovely pieces. They dried quickly and before I knew it I was ready to start sewing with my new custom fabric. 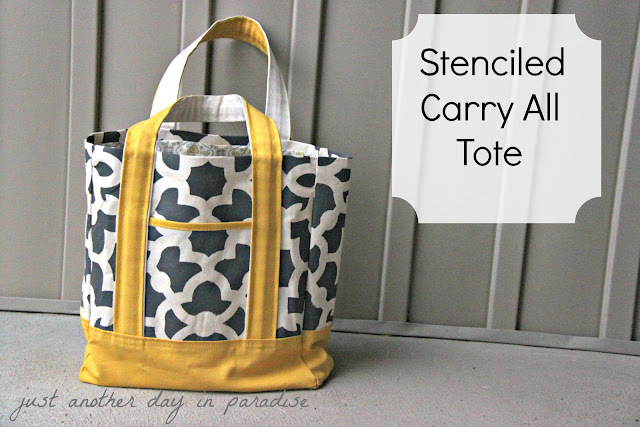 Now thanks to some especially lovely stenciled fabric I have quite a gorgeous Carry All Tote. 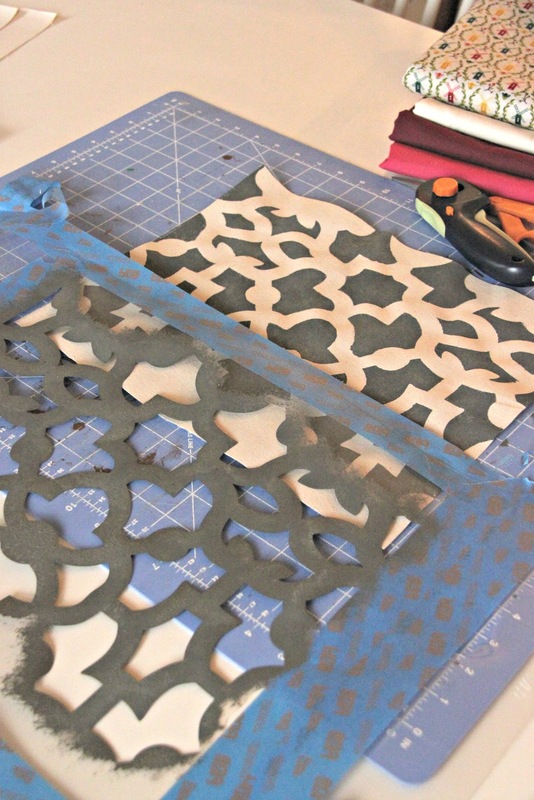 Are you already imagining all the lovely things you can make using their stencils? 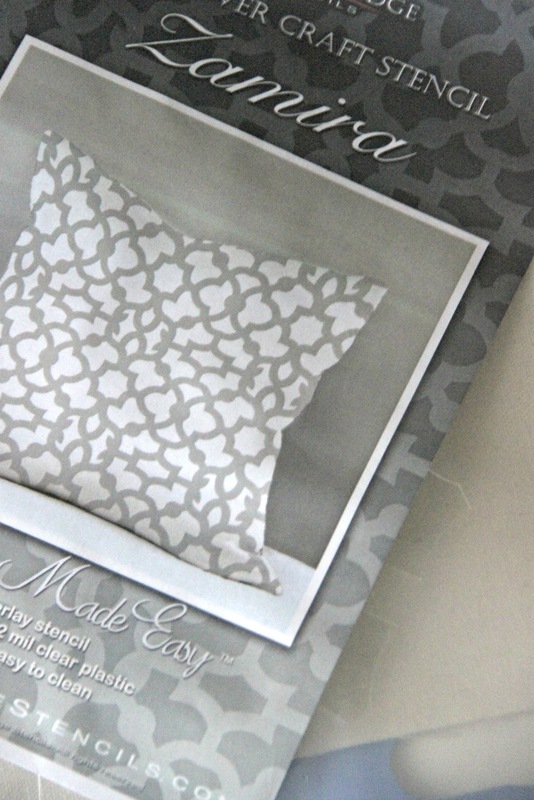 You know you are now listing in your head all the stenciling projects you can do. You know you want one of your own! Well woohoo! This is your day. 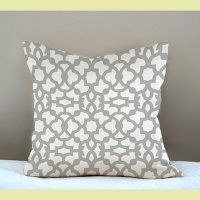 Cutting Edge Stencils are giving one of my readers(US Residents only) one stencil up to $50 in value. The winner will be able to pick out their favorite stencil and Cutting Edge Stencils will ship it to the winner for free. Can I get a woohoo?? To earn an entry for this completely awesome entry all you have to do is head on over to Cutting Edge Stencil and browse around. Leave me a comment letting me know which stencil is your favorites. Get this though, you can more entries. That is four extra chances to win yourself an awesome stencil. Just make sure to leave me a comment for each entry and make sure to give your email address. The giveaway will go through Friday, December 7th 11:59pm pst. I couldn't choose, actually. I LOVE Paisley. Anything paisley...and they just had TOO many to choose from. But, I really did like the vintage paisley wall stencil. I would use different colors but I loved it. I like the Scroll Alessa stencil. I love the birch forest stencil! My husband and I love hiking....this totally would fit our personalities! I like your stencil but as you well know I can't craft. So, unless you decided to do a giveaway for the adorable bag you made I'm at a loss. Maybe I could give the stencil as a gift to someone else. *sigh* You should sell those bags though. They are seriously so cute!! Could I buy one?? I liked you on facebook, and I LOVE the chevron allover stencil! That Zinnia Grande Flower Stencil is wonderful! I love the Vintage Paisley Stencil. I love the Budding Clematis wall stencil. I follow your blog and also receive email updates. I'm now following the Cutting Edge Stencils Blog by email. I adore your stencil, but I also do love the cheveron! I am a long time follower of your blogdiggity! The Zamira and Fishscales stencils are my absolute favs! Whoohoo. I love the Birch stencil! I really Like the "Funky Wheel" Pattern but I guess that would be my 3rd choice, cause I already have two others on order! LOL I LOVE Cutting Edge! I Love the cutting Edge Stencils, and I really love the Funky wheel! The Birch Forest Allover Stencil is my absolute favorite, but there are really so many great ones to choose from!